Decide.com (Android) - Helps you choose the best deals on electronics ~ Android Forever! Get the best deals on consumer electronics by knowing WHEN TO BUY that next gadget or video game. 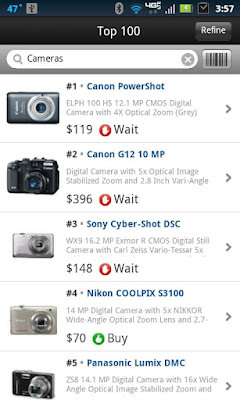 Like a crystal ball for all your electronics shopping, the Decide.com App for Android is the only app that tells you to BUY NOW or WAIT. Decide shows you the best online and local prices on electronics, predicts whether prices will go up or down in the near future and whether a newer, better product will release soon. Decide.com is FREE on the Android Market!